The eighth Wasp (CV-7) was laid down on 1 April 1936 at Quincy, Mass.,by the Bethlehem Shipbuilding Co.; launched on 4 April 1939, sponsored byMrs. Charles Edison, the wife of the Assistant Secretary of the Navy, CharlesEdison, and commissioned on 25 April 1940 at the Army Quartermaster Base,South Boston, Mass., Capt. John W. Reeves, Jr., in command. Wasp remained at Boston through May, fitting out before she got underwayon 5 June 1940 for calibration tests on her radio direction finder gear.After further fitting out while anchored in Boston harbor, the new aircraftcarrier steamed independently to Hampton Roads, Va., anchoring there on24 June. Four days later, she sailed for the Caribbean in company with Morris(DD-417) . En route, she conducted the first of many carrier qualification tests.Among the earliest of the qualifiers was Lt. (jg.) David T. McCampbell,who later became the Navy's top-scoring "ace" in World War II.Wasp arrived at Guantanamo Bay in time to "dress ship" in honorof Independence Day. Tragedy marred the carrier's shakedown. On 9 July, one of her VoughtSB2U-2 Vindicators crashed two miles from the ship. Wasp bent on flank speedto close, as did the plane guarding destroyer Morris. The latter's boatsrecovered items from the plane's baggage compartment, but the plane itselfhad gone down with its crew of two. Wasp departed Guantanamo Bay on 11 July and arrived at Hampton Roadsfour days later. There, she embarked planes from the 1st Marine Air Groupand took them to sea for qualification trials. Operating off the southerndrill grounds, the ship and her planes honed their skills for a week beforethe marines and their planes were disembarked at Norfolk; and the carriermoved north to Boston for post-shakedown repairs. While civilian workmen from the Bethlehem Steel Co.came on board theship to check their workmanship and to learn how it had stood up under therigors of shakedown, Wasp lay alongside the same pier at which she had beencommissioned. While at Boston, she fired a 21-gun salute and rendered honorsto President Franklin D. Roosevelt, whose yacht, Potomac (AG-25) had stoppedbriefly at the Boston Navy Yard on 10 August. Wasp departed the Army QuartermasterBase on the 21st to conduct steering drills and full-power trials. Latethe following morning, she got underway for Norfolk. For the next few days,while Ellis (DD-154) operated as plane guard, Was p launched and recoveredher aircraft: fighters from Fighter Squadron (VF) 7 and scout-bombers fromScouting Squadron (VS) 72 The carrier put into the Norfolk Navy Yard on28 August for repair work on her turbines-alterations which kept the shipin dockyard hands into the following month. Drydocked during the periodfrom 12 to 18 September, Wasp ran her final sea trials in Hampton Roadson 26 September 1940. Ready now to join the fleet and assigned to Carrier Division (CarDiv)3, Patrol Force, Wasp shifted to Naval Operating Base (NOB), Norfolk, fromthe Norfolk Navy Yard on 11 October. There, she loaded 24 P-40's from the8th Army Pursuit Group and nine O-47A's from the 2d Observation Squadron,as well as her own spares and utility unit Grumman J2F's on the 12th. Proceedingto sea for maneuvering room, Wasp flew off the Army planes in a test designedto compare the take-off runs of standard Navy and Army aircraft. That experiment,the first time that Army planes had flown from a Navy carrier, foreshadowedthe use of the ship in the ferry role that she performed so well in WorldWar II. Wasp then proceeded on toward Cuba in company with Plunkett (DD-431)and Niblack (DD-424). The carrier's planes flew routine training flights,including dive bombing and machine gun practices, over the ensuing fourdays. Upon arrival at Guantanamo, Wasp's saluting batteries barked out a13-gun salute to Rear Admiral Hayne Ellis, Commander, Atlantic Squadronembarked in Texas (BB-35), on 19 October. For the remainder of October and into November Wasp trained in the GuantanamoBay area. Her planes flew carrier qualification and refresher training flightswhile her gunners sharpened up their skills in shortrange battle practicesat targets towed by the new fleet tug Seminole (AT-65). While operatingin the Culebra, Virgin Islands, area, Wasp again teamed with the aviatorsof the 1st Marine Air Wing, giving the flying leathernecks practice in carriertake-offs and landings. Her work in the Caribbean finished, Wasp sailed for Norfolk and arrivedshortly after noon on 26 November. She remained at the Norfolk Navy Yardthrough Christmas of 1940. Then, after first conducting degaussing experiments with Hannibal (AG-1), she steamed independently to Cuba. Arriving at Guantanamo Bay on 27 January 1941, Wasp conducted a regularroutine of flight operations into February. With Walke (DD-416) as her planeguard, Wasp operated out of Guantanamo and Culebra conducting her maneuverswith an impressive array of warships-Texas Ranger (CV-4), Tuscaloosa (CA37),Wichita (CA-45) and a host of destroyers. Wasp ran gunnery drills and exercises,as well as routine flight training evolutions, into March. Underway forHampton Roads on 4 March, the aircraft carrier conducted a night battlepractice into the early morning hours of the 5th. During the passage to Norfolk, heavy weather sprang up on the evening of 7 March. Wasp was steaming at standard speed 17 knots, a pace that she had been maintaining al; day. Off Cape Hatteras, a lookout in the carrierspotted a red flare arcing into the stormy black night skies at 2245. Thebig ship swung around to head in the direction of the distress signal whilea messenger notified the captain, who reached the bridge in an instant.Capt. Reeves himself took the cone, as a second set of flares was seen at2259. Finally, at 2329, with the aid of her searchlights probing the wet night,Wasp located the stranger in trouble. She proved to be the lumber schooner George E. Klinck, bound from Jacksonville, Fla., to Southwest Harbor, Maine. The sea, in the meantime, worsened from a state 5 to a state 7. Wasplay to, maneuvering alongside at 0007 on 8 March. At that time, four menfrom the schooner clambered up a swaying jacob's ladder buffeted by gusts of wind. Then, despite the raging tempest, Wasp lowered a boat, at 0016,and brought the remaining four men aboard from the foundering 152-foot schooner. Later that day, Wasp disembarked her rescued mariners and immediatelywent into drydock at the Norfolk Navy Yard. The ship received vital repairsto her turbines. Port holes on the third deck were welded over to providebetter watertight integrity, and steel splinter shielding around her 5-inchand 1.1-inch batteries was added. After those repairs and alterations were finished Wasp got underway for the Virgin Islands on 22 March, the carrier arriving at St. Thomas three days later. She soon shifted to Guantanamo Bay and loaded marine stores for transportation to Norfolk. Returning to Norfolk on 30 March, Wasp conducted routine flight operationsout of Hampton Roads over the ensuing days, into April. In company withSampson (DD 394), the carrier conducted an abortive search for a downedpatrol plane in her vicinity on 8 April. For the remainder of the month,Was p operated off the eastern seaboard between Newport, R.I., and Norfolk,conducting extensive flight and patrol operations with her embarked airgroup. She shifted to Bermuda in mid-May, anchoring at Grassy Bay on the12th. Eight days later, the ship got underway in company with Quincy (CA-39),Livermore (DD-429), and Kearng (DD-432) for exercises at sea before returningto Grassy Bay on 3 June. Wasp sailed for Norfolk three days later with Edison(DD-439) as her antisubmarine screen. After a brief stay in the Tidewater area, Wasp headed back toward Bermudaon 20 June. Wasp and her escorts patrolled the stretch of the Atlantic betweenBermuda and Hampton Roads until 5 July, as the Atlantic Fleet's neutralitypatrol zones were extended eastward. Reaching Grassy Bay on that day, sheremained in port a week before returning to Norfolk sailing on 12 July incompany with Tuscaloosa (CA37), Grayson (DD-435), Anderson (DD-411), andRowan (DD-405). Following her return to Norfolk on the 13th, Wasp and her embarked airgroup conducted refresher training off the Virginia capes. Meanwhile, thesituation in the Atlantic had taken on a new complexion, with American participationin the Battle of the Atlantic only a matter of time, when the United Statestook another step toward involvement on the side of the British. To protectAmerican security and to free British forces needed elsewhere, the UnitedStates made plans to occupy Iceland. Wasp played an important role in themove. Late on the afternoon of 23 July, while the carrier lay alongside Pier7, NOB Norfolk, 32 Army Air Force (AAF) pilots reported on board "fortemporary duty." At 0630 the following day, Wasp's crew watched aninteresting cargo come on board, hoisted on deck by the ship's cranes: 30Curtiss P-40C's and three PT-17 trainers from the AAF 33d Pursuit Squadron,8th Air Group, Air Force Combat Command, home based at Mitchell Field, N.Y.Three days later, four newspaper correspondents-including the noted journalist Fletcher Pratt-came on board. The carrier had drawn the assignment of ferrying those vital army planesto Iceland because of a lack of British aircraft to cover the American landings.The American P 40's would provide the defensive fighter cover necessaryto watch over the initial increment of American occupying forces. Wasp consequentlycast off from Pier 7 and slipped out to sea through the swept channel at0932 on 28 July, with O'Brien (DD-416) and Walke as plane guard. Vincennea(CA-44) later joined the formation at sea. Within a few days, Wasp's group joined the larger Task Force (TF) 1~consistingof Mississippi (BB41), Quincy, Wichita, five destroyers, Semmes (AG24),American Legion (AP-36), Mizar (AF-12), and Almaack (AK-27). Those ships,too, were bound for Iceland with the first occupation troops embarked. Onthe morning of 6 August, Wasp, Vincennes, Walke, and O'Brien parted companyfrom TF 16. Soon thereafter the carrier turned into the wind and commencedlaunching the planes from the 33d Pursuit Squadron. As the P-40's and thetrio of trainers droned on to Iceland, Wasp headed home for Norfolk, herthree escorts in company. After another week at sea, the group arrived backat Norfolk on 14 August. Underway again on 22 August, however, Wasp put to sea for carrier qualificationsand refresher landings off the Virginia capes. Two days later, Rear AdmiralH. Kent Hewitt, Commander, Cruisers Atlantic Fleet, shifted his flag fromSavannah (CL 42; to Wasp while the ships lay anchored in Hampton Roads.underway on the 25th, in company with Savannah, Monssen (DD436) and Kearney,the aircraft carrier conducted flight operations over the ensuing days.Scuttlebutt on board the carrier had her steaming out in search of a German heavy cruiser, Admiral Hipper, which was reportedly roaming the westernAtlantic in search of prey. Suspicions were confirmed for many on the 30thwhen the British battleship HMS Rodnev was sighted some 20 miles away, onthe same course as the Americans. In any event, if they had been in search of a German raider, they didnot make contact with her. Wasp and her escorts anchored in the Gulf ofParia, Trinidad, on 2 September, where Admiral Hewitt shifted his flag back to Savannah. The carrier remained in port until 6 September, when she againput to sea on patrol "to enforce the neutrality of the United Statesin the Atlantic." While at sea, the ship received the news of a German U-boat unsuccessfullyattempting to attack the destroyer Greer (DD-145). The United States hadbeen getting more and more involved in the war; American warships were nowconvoying British merchantmen halfway across the Atlantic to the "mid-oceanmeeting point" (MOMP). Wasp's crew looked forward to returning to Bermuda on 18 September, butthe new situation in the Atlantic meant a change in plans. Shifted to thecolder climes of Newfoundland, the carrier arrived at Placentia Bay on 22September and fueled from Salinas (AO19) the following day. The respitein port was a brief one, however, as the ship got underway again, late onthe 23d, for Iceland. In company with Wichita, four destroyers, and the repair ship Vulcan (AR-5), Wasp arrived at Hvalfjordur, Iceland, on the 28th. Two days earlier, Admiral Harold R. Stark, the Chief of Naval Operations,had ordered American warships to do their utmost to destroy whatever Germanor Italian warships they found. The "short-of-war" operationswere drawing frightfully close to the real thing! November, Wasp operated on patrols out of Bermuda for the remainder ofthe month. October had seen the incidents involving American and German warshipsmultiplying on the high seas. Kearng, was torpedoed on 17 October; Salinastook a "fish" on the 28th; and in the most tragic incident that autumn, Reuben James (DD 245) was torpedoed and sunk with heavy loss oflife on 30 October. Meanwhile in the Pacific, tension between the UnitedStates and Japan increased almost with each passing day. Wasp slipped out to sea from Grassy Bay on 3 December and rendezvousedwith Wilron (DD-408). While the destroyer operated as plane guard, Wasp'sair group flew day and night refresher training missions. In addition, thetwo ships conducted gunnery drills before returning to Grassy Bay two days later. Wasp lay at anchor on 7 December 1941, observing "holiday routine"-itbeing a Sunday. In the Pacific, the Japanese broke the Sunday morning peacein a devastating surprise attack on the Pacific Fleet at Pearl Harbor. Theirdaring attack plunged the United States into World War II in both oceans.On 11 December, Germany and Italy followed Japan into war against the UnitedStates. Meanwhile, naval authorities felt considerable anxiety that French warshipsin the Caribbean and West Indies were prepared to make a breakout and attemptto get back to France. Accordingly, Wasp, Brooklyn (C~40), and two destroyers,Sterett (DD 407) and Wilson, departed Grassy Bay and headed for Martinique.Faulty intelligence gave American authorities in Washington the impressionthat the Vichy French armed merchant cruiser Barfleur had gotten underwayfor sea. The French were accordingly warned that the auxiliary cruiser wouldbe sunk or captured unless she returned to port and resumed her internment.As it turned out, Barfleur had not departed after all, but had remainedin harbor. The tense situation at Martinique eventually dissipated, andthe crisis abated. With tensions in the West Indies lessened considerably, Wasp departedGrassy Bay and headed for Hampton Roads three days before Christmas, incompany with Long Island (AVG-1), and escorted by Stack (DD-406) and Sterett.Two days later, the carrier moored at the Norfolk Navy Yard to commence an overhaul that would last into 1942. After departing Norfolk on 14 January 1942, Wasp headed north and touchedat Argentia, Newfoundland, and Casco Bay, Maine, while operating in those northern climes. On 16 March, as part of Task Group (TG) 22.6, she headedback toward Norfolk. During the morning watch the next day, visibility lessened considerably, and, at 0550, Wasp's bow plunged into Stack's starboard side,punching a hole and completely flooding the destroyer's number one fireroom.Stack was detached and proceeded to the Philadelphia Navy Yard, where herdamage was repaired. Wasp, meanwhile, made port at Norfolk on the 21st without further incident.Shifting back to Casco Bay three days later, she sailed for the BritishIsles on 26 March, with Task Force (TF) 39 under the command of Rear AdmiralJohn W. Wilcox, Jr., in Washington (BB-56). That force was to reinforcethe Home Fleet of the Royal Navy. While en route, Rear Admiral Wilcox was swept overboard from the battleship and drowned. Although hampered by poor visibility conditions, Wasp planes took part in the search. Wilcox' body was spotted an hour later, face down in the raging seas, but it was notrecovered. Rear Admiral Robert C. Giffen, who flew his flag in Wichita, assumedcommand of TF-39. The American ships were met by a force based around thelight cruiser HMS Edinburgh on 3 April. Those ships escorted them to ScapaFlow in the Orkney Islands. estuary and Greenock, Scotland. On the following day, the carrier sailedup the Clyde River, past the John Brown Clydebank shipbuilding facilities.There, shipyard workers paused long enough from their labors to accord Waspa tumultuous reception as she passed. Wasp's impending mission was an important one-one upon which the fate of the island bastion of Malta hung. That key isle was then being pounded daily by German and Italian planes. The British,faced with the loss of air superiority over the island, requested the useof a carrier to transport planes that could wrest air superiority from the Axis aircraft. Wasp drew ferry duty once again. Having landed her torpedo planes and dive bombers, Wasp loaded 47 Supermarine"Spitfire" Mk. V fighter planes at the King George Dock, Glasgow,on 13 April, before she departed the Clyde estuary on the 14th. Her screenconsisted of Force "W" of the Home Fleet- a group that included the battle cruiser HMS Renown and antiaircraft cruisers HMS Cairo and HMSChariVdis. Madison (DD-425) and Lang (DD-399) also served in Wasp's screen. Wasp and her consorts passed through the Straits of Gibraltar under cover of the pre-dawn darkness on 19 April, avoiding the possibility of being discovered by Spanish or Axis agents. At 0400 on 20 April, Wasp spotted 11 Grumman F4F-4 Wildcat fighters on her deck and quickly launched themto form a combat air patrol (CAP) over Force "W". Meanwhile, the"Spitfires" were warming up their engines in the hangar deck spacesbelow. With the Wildcats patrolling overhead, the Spitfires were broughtup singly on the after elevator, spotted for launch, and then given thego-ahead to take off. One by one, they roared down the deck and over theforward rounddown, until each Spitfire was aloft and winging toward Malta. When the launch was complete, Wasp retired toward England having safelydelivered her charges. Unfortunately those "Spitfires," whichflew in to augment the dwindling numbers of "Gladiator" and "Hurricane"fighters, were tracked by efficient Axis intelligence and their arrivalpinpointed. The unfortunate "Spitfires" were decimated by heavyGerman air raids which caught many planes on the ground. As a result, it looked as if the acute situation required a second ferryrun to Malta. Accordingly, Prime Minister Winston Churchill, fearing thatMalta would be "pounded to bits," asked President Roosevelt toallow Wasp to have "another good sting." Roosevelt responded inthe affirmative. Rising to the occasion, Wasp loaded another contingentof "Spitfire" V's and sailed for the Mediterranean on 3 May. Again,especially vigilant for submarines, Wasp proceeded unmolested. This time,the British aircraft carrier HMS liagle accompanied Wasp; and she, too,carried a contingent of Spitfires bound for the "unsinkable aircraftcarrier," Malta. The two Allied flattops reached their launching points early on Saturday,9 May, with Wasp steaming in column ahead of Eagle at a distance of 1,000yards. At 0630, Wasp commenced launching planes-11 F4F4's of VF-71 to serveas CAP over the task force. The first "Spitfire" roared down thedeck at 0643, piloted by Sergeant-Pilot Herrington, but lost power soonafter takeoff and plunged into the sea. Both pilot and plane were lost. Undaunted by the loss of Herrington, the other planes flew off safelyand formed up to fly to Malta. Misfortune, however, again seemed to dogthe flight when one pilot accidentally released his auxiliary fuel tankas he climbed to 2,000 feet. He obviously could not make Malta, as the slipperytank fitted beneath the belly of the plane had increased the range of theplane markedly. With that gone, he had no chance of making the island. Hisonly alternatives were to land back on board Wasp or to ditch and take hischances in the water. Sergeant-Pilot Smith chose the former. Wasp bent on full speed and recoveredthe plane at 0743. The "Spitfire" came to a stop just 15 feetfrom the forward edge of the flight deck, making what one Wasp sailor observedto be a "one wire" landing. With her vital errand completed, thecarrier set sail for the British Isles while a German radio station broadcastthe startling news that the American carrier had been sunk! Most in theAllied camp knew better, however and, on 11 May, Prime Minister Churchill sent a witty message to thecaptain and ship's company of Wasp: "Many thanks to you all for thetimely help. Who said a Wasp couldn't sting twice?" 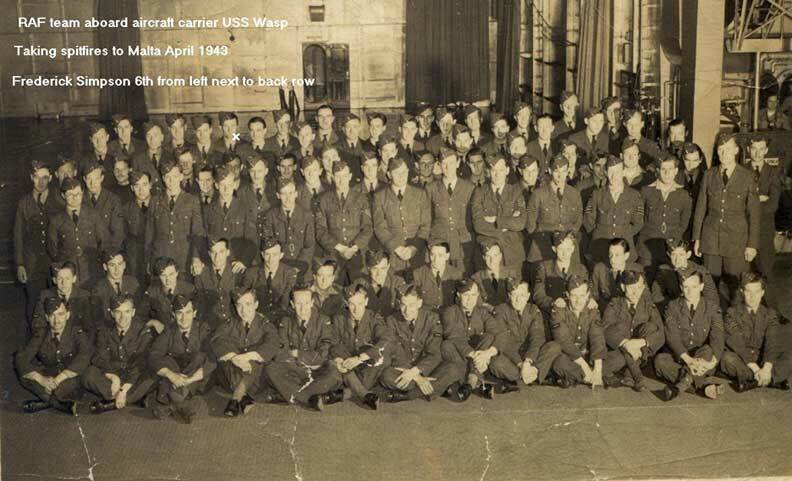 While Wasp was conducting those two important missions to Malta, a trainof events far to the westward beckoned the carrier to the Pacific theater.Early in May, almost simultaneously with Was p's second Malta run-Operation"Bowery"-the Battle of the Coral Sea had been fought. That actionturned back the Japanese thrust at Port Moresby. One month later, from 4to 6 June, an American carrier force smashed its Japanese counterpart inthe pivotal Battle of Midway. These two victories cost the United Statestwo precious carriers: Lexington (CV-2) at Coral Sea and Yorktown (CV-5)at Midway. While the Japanese had suffered the damaging of two at CoralSea and the loss of four carriers at Midway, the United States could scarcelyafford to be left with only two operational carriers in the western andcentral Pacific-Enterprise (CV-6) and Hornet (CV-8). Saratoga (CV-3) wasstill undergoing repairs and modernization after being torpedoed off Oahuin early January 1942. To prepare to strengthen the American Navy in the Pacific, Wasp was hurriedback to the United States for alterations and repairs at the Norfolk NavyYard. During the carrier's stay in the Tidewater region, Capt. Reeves-whohad been promoted to flag rank-was relieved by Capt. Forrest P. Shermanon 31 May. Departing Norfolk on 6 June, the last day of the critical Battleof Midway, Wasp sailed with TF 37 which was built around the carrier andthe new battleship North Carolina (BB-55) and escorted by Quincy (CA-39)and San Juan ( CL-54 ) and a half -dozen destroyers. The group transitedthe Panama Canal on 10 June, at which time Wasp and her consorts becameTF 18, the carrier flying the two-starred flag of Rear Admiral Leigh Noyes. Arriving at San Diego on 19 June, Wasp embarked the remainder of hercomplement of aircraft, Grumman TBF-1's and Douglas SBD-3's-10 of the formerand 12 of the latter conducting their carrier qualification on 22 and 23June, respectively-the latter replacing the old Vindicators. On 1 July,she sailed for the Tonga Islands as part of the convoy for the five transportsthat had embarked the 2d Marine Regiment. While TF 18 and the transports were en route to Tongatabu, Wasp receivedanother congratulatory message-this time from Admiral Noyes, embarked inthe ship. "During the two weeks my flag has been in Wasp I have beenvery favorably impressed by the fine spirit of her ship's company and theway that all hands have handled their many problems. Since we have beenat sea, every day has shown marked improvement in operations. I am surethat when our opportunity comes to strike the enemy in this ocean, Was pand her squadrons will add more glory to the name she bears." Noyes'hopes were to be realized, but for all too brief a time. Four days out of Nuknalofa harbor Wasp developed serious engine trouble.The ship's "black gang," however, worked diligently to do thepreliminary work in lifting, repairing, and replacing the ship's starboardhigh-pressure turbine. The work done en route substantially helped enoughto allow speedy completion of the repairs after the ship dropped her hookat Tongatabu on 18 July. Meanwhile, preparations to invade the Solomon Islands were proceedingapace. Up to that point, the Japanese had been on the offensive, establishingtheir defensive perimeter around the edge of their "Greater East AsiaCo-Prosperity Sphere." On 4 July, while Was p was en route to the South Pacific, the Japaneselanded on Guadalcanal. Allied planners realized that if the enemy operatedlandbased aircraft from that key island, then it immediately imperiled Alliedcontrol of the New Hebrides and New Caledonia area. Rather than wait untilthe Japanese were firmly entrenched, they proposed to evict the Japanesebefore they got too deeply settled. Vice Admiral Robert L. Ghormley-whohad attained a sterling record in London as Special Naval Observer-was detailedto take command of the operation, and he established his headquarters at Auckland, New Zealand. Since the Japanese had gotten a foothold on Guadalcanal,time was of the essence. Preparations for the invasion proceeded apace withthe utmost secrecy and speed. Was p-together with the carriers Saratoga and Enterprise-was assignedto the Support Force under Vice Admiral Frank Jack Fletcher. Under the tacticalcommand of Rear Admiral Noyes, embarked in Wasp the carriers were to provide air support for the invasion. Wasp and her airmen worked intensively practicing day and night operationsto hone their skills to a high degree. Pilot qualification and training,necessitated by the ship's recent operations in the Atlantic and by there-equipment of her air group and newer types of planes, proceeded at an intensive pace and, by the time the operations against Guadalcanal were pushed into high gear, Capt. Sherman was confident that his airmen could perform their mission. "D-day" had originally been set for 1 August,but the late arrival of some of the transports carrying marines pushed thedate to 7 August. Wasp, screened by San Francisco (CA-38), Salt Lake City (CA-25), andfour destroyers, steamed westward toward Guadalcanal on the evening of 6August until midnight. Then, she changed course to the eastward to reachher launch position 84 miles from Tulagi one hour before the first raysof sunlight crept over the horizon. A fresh breeze whipped across the carrier'sdarkened flight deck as the first planes were brought up to prepare forlaunch. The night offshore was bright, but clouds hung heavily over the assigned objective. So far, so good. No Japanese patrols had been spotted. At 0530, the first planes from Wasp's air group barreled down the deck:16 F4F-4's under Lt. Comdr. Courtney Shands. Then, 15 SBD-3's under Lt.Comdr. John Eldridge, Jr. and the TBF-1 flown by the air group commander,Lt. Comdr. Wallace M. Beakley- fitted with a larger gasoline tank in itsbomb bay to lengthen its time in the air-followed seven minutes later. At0557, the first combat air patrol fighter took off. The early flights of F4F's and SBD's were assigned specific targets:Tulagi, Gavutu, Tanambogo, Halavo, Port Purvis, Haleta, Bungana, and theradio station dubbed "Asses' Ears." After taking off, the 16 Wildcatssplit up into sections and raced off to their respect*e hunting areas. Atabout 0600, the planes passed over the transport area off Lunga Point, asthe ships were preparing to disembark their troops. In the pre dawn darkness,the ships were almost invisible until the fighters passed directly overthem. Soon, the fourth division of Shands' flight climbed to 5,000 feetabove Tulagi to serve as CAP for the strafers. The third division brokeoff and headed for their target-Haleta- before Shands took three planesaround the northwest tip of Tulagi. Shands and his wingman, Ens. S. W. Forrer, then swung down the northcoast toward Gavatu. The other two headed for Tanambogo, to work over theseaplane facilities there. The Japanese appeared to be caught flat-footed,and the Grummans, arriving simultaneously at daybreak, shot up all of thepatrol planes and fighter seaplanes that were in the area. Fifteen Kawanishiflying boats and seven Nakajima floatplane fighters-the seaplane derivativeof the Mitsubishi "Zero"-were destroyed by Shands' fighters thatflew almost "on the deck." Shands himself bagged at least fourNakajima single-float fighter seaplanes and one four-engined flying boat.His wingman, Forrer, bagged three floatplane fighters and one patrol planeLt. Wright and Ens. Kenton bagged three patrol planes apiece and destroyeda motorboat apparently attempting to tend the flying boats; Ensigns Reevesand Conklin each bagged two and shared a fifth patrol plane between them.In addition, the strafing F4F's destroyed an aviation fuel truck and a truckloaded with spare parts. The SBD's, too, laid their bombs "on the money." Post-attackassessment estimated that the antiaircraft and shore battery sites pinpointedby intelligence had been destroyed by the dive bombers in their first attack.So complete was the enemy's unpreparedness that none of Wasp's planes wasshot down. Only one plane from the 16 Grummans failed to return, and, inthat case its pilot, Ensign Reeves, put her down on board Enterprise afterhaving run low on fuel. That was not all, however. At 0704, 12 Grumman TBF-1's, led by Lt. H.A. Romberg, rolled ponderously down the deck, loaded with bombs for useagainst land targets. Having encountered resistance, the initial landingforces called for help. Romberg's dozen Avengers blasted enemy troop concentrationseast of the nob of land known as Hill 281, in the Makambo-Sasapi sectorand the prison on Tulagi Island. "All enemy resistance," the officialreport later stated, was "apparently effectively silenced by this flight." The first day's operations against Guadalcanal had proved successful.Some 10,000 men had been put ashore there and met only slight resistance.On Tulagi, however, the Japanese resisted stoutly, retaining about one-fifthof the island by nightfall. Wasp, Saratoga and Enterprise, with their screens,retired to the southward at nightfall. Wasp returned the next morning, 8 August, to maintain a continuous CAPover the transport area until noon. These fighters were led by Lt. C. S.Moffett. Meanwhile, she also launched a scouting flight of 12 SBD-3's ledby Lt. Comdr. E. M. Snowden. The Dauntlesses searched a sector to a radiusof 220 miles from their carrier, extending it to include all of the SantaIsabel Island and the New Georgia group. The Dauntless pilots sighted nothing that morning and made no contactwith the enemy during their two hours in the air. But that was soon to changefor the flight leader. At 0815, Snowden sighted a "Rufe" some40 miles from Rekata Bay and gave chase. The Japanese airman, seeing thathe had been spotted, had no stomach for a fight. He pulled up and attemptedto use the clouds for cover. Each time the dogged dive bomber pilot gunnedthe SBD-3 after him: twice the "Rufe" headed for the clouds. Snowdenfinally pulled within close range, and, using his two fixed .50-caliberguns, fired a short burst that hit home, causing the "Rufe" tospin into the Solomon Sea. Meanwhile, a large group of Japanese planes approached from Bougainville,apparently bent upon attacking the transports off Lunga Point. Upon learningof their approach, Rear Admiral Richmond K. Turner ordered all transportsto get underway and to assume cruising disposition. The Americans accordinglycleared the decks for action. Wasp's planes took part in the melee thatfollowed-some planes by accident. Lt. Comdr. Eldridge-again leading a formation of SDB-3's from VS-71-hadled his planes against Mbangi Island, off Tulagi, the site of some stillfierce Japanese resistance. Eldridge's rear seat gunner, Aviation ChiefRadioman L. A. Powers, suddenly spotted a formation of planes coming infrom the northeast: but thinking them to be a relief flight, Eldridge continue]on his present course. The Americans did a double take, however, and discoveredthat the planes were, in fact, enemy. At that instant, six "Zeroes"showed up and bounced the first section, but showed remarkably little skillin the attack, for they made 12 firing passes but could not down any ofthe Dauntlesses. Meanwhile, the leader of the last section of VS-71 Lt. (jg.) Robert L.Howard, spotted a cluster of twinengined G4M1 "Betty" bombersheading for the American transports. Howard dove to the attack, but, inhis excitement, failed to flip his armament switch to "on." Aftertwo runs during which his guns had failed to fire-thinking that the gunsneeded to be recharged- he discovered his error-but too late to do anythingabout the Mitsubishi bombers. At that moment, four "zeroes," escortsfor the bombers, attacked the single SBD. Howard's rear gunner, Seaman 2d Class Lawrence P. Lupo, handled his twin 30 caliber mount magnificently and kept the enemy fighters at arm's length,his bullets scoring several hits on them as well. After about eight passes,one "Zero" veered up sharply and made a head-on run that Howardmet with simultaneous fire from his fixed .50's. The "Zero" caughtfire like a flying tinder box, passed close aboard the Dauntless' left wing,and crashed in flames amidst the American landing craft far below. At thesame time Howard was downing the "Zero" ahead, Seaman Lupo wasfiring on another "Zero" making an attack from the stern. Lupokept the enemy away, but he had to shoot through his own plane's verticalstabilizer to do it. Eventually the enemy tired of sporting with the SBDand retired to leave Howard and his squadron mates in VS-71 to return safelyto their carrier. At 1807 on 8 August, Vice Admiral Frank Jack Fletcher recommended to Ghormley, at Noumea, that the air support force be withdrawn. Fletcher,concerned by the large numbers of enemy planes that had attacked on the8th, reported that he had only 78 fighters left (he had started with 99)and that fuel for the carriers was running low. Ghormley approved the recommendation,and Wasp joined Enterprise and Saratoga in retiring from Guadalcanal. Bymidnight on 8 August, the landing had been a success having attained theimmediate objectives of the landing. All Japanese resistance-but a few snipers-onGavutu and Tanombogo had been overcome. Early on 9 August, a Japanese surfaceforce engaged an American one off Savo Island and retired at very littlecost to themselves. The Allied force suffered loss of four heavy cruisersoff Savo Island, including two that had served with Wasp in the Atlantic:Vincennes and Quincy. The early and unexpected withdrawal of the supportforce, including Wasp, when coupled with Allied losses in the Battle ofSavo Island, jeopardized the success of the operation in the Solomons. After the initial day's action in the Solomons campaign, the carrierspent the next month engaged in patrol and covering operations for convoysand resupply units headed for Guadalcanal. The Japanese, while reactingsluggishly to the initial thrust at Guadalcanal soon began pouring reinforcementsdown to contest the Allied forces. Wasp was ordered south by Vice Admiral Fletcher to refuel and did notparticipate in the Battle of Eastern Solomons on 24 August 1942. That engagementcost the American force the use of the valuable Enterprise. 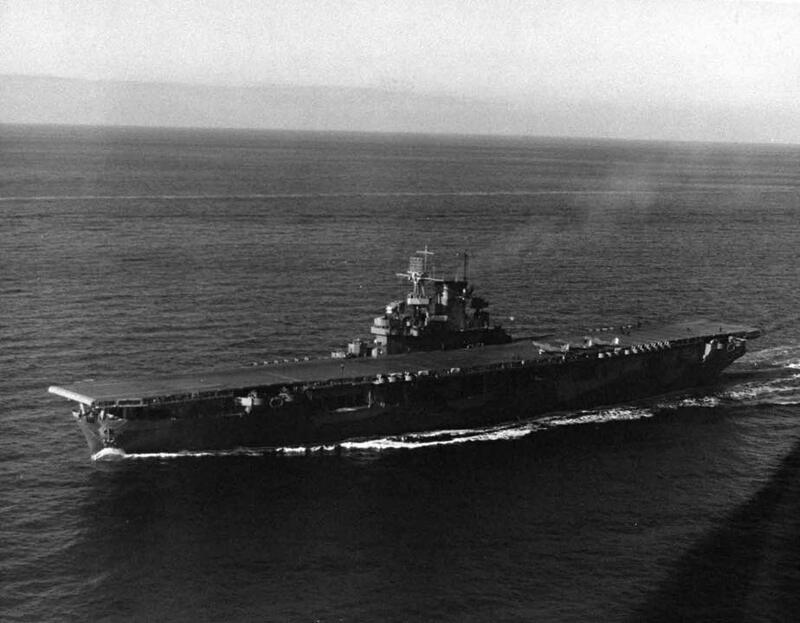 Saratoga wastorpedoed a week later and departed the South Pacific war zone for repairsas well. That left only two carriers in the southwest Pacific: Hornet- whichhad been in commission for only a year-and Wasp. On Tuesday, 15 September, those two carriers and North Carolina-with10 other warships-were escorting the transports carrying the 7th MarineRegiment to Guadalcanal as reinforcements. Wasp had drawn the job of ready-dutycarrier and was operating some 150 miles southeast of San Cristobal Island.Her gasoline system was in use, as planes were being refueled and rearmedfor antisubmarine patrol missions; and Wasp had been at general quartersfrom an hour before sunrise until the time when the morning search returnedto the ship at 1000. Thereafter the ship was in condition 2, with the airdepartment at flight quarters. There was no contact with the enemy duringthe day, with the exception of a Japanese four-engined flying boat downedby a Wasp Wildcat at 1215. About 1420, the carrier turned into the wind to launch eight fightersand 18 SBD-3's and to recover eight F4F-3's and three SBD's that had beenairborne since before noon. The ship rapidly completed the recovery of the11 planes, she then turned easily to starboard, the ship heeling slightlyas the course change was made. The air department at flight quarters, asthey had done in earlier operations, worked coolly at refueling and respottingthe ship's planes for the afternoon mission. Suddenly, at 1444, a lookoutcalled out, "three torpedoes . . . three points forward of the starboardbeam!" A spread of four torpedoes, fired from the tubes of the Japanese submarine1-19, churned inexorably closer. Wasp put over her rudder hard-a-starboard,but it was too late. Two torpedoes smashed home in quick succession whilea fourth passed ahead. Both hit in the vicinity of gasoline tanks and magazines. In quick succession, fiery blasts ripped through the forward part ofthe ship. Aircraft on the flight and hangar decks were thrown about as ifthey were toys and dropped on the deck with such force that landing gearssnapped. Planes triced up in the hangar overheads fell and landed upon thoseon the hangar deck; fires broke out almost simultaneously in the hangarand below decks. Soon, the heat of the intense gasoline fires detonatedthe ready ammunition at the forward antiaircraft guns on the starboard side;and fragments showered the forward part of the ship. The number two 1.1-inchmount was blown overboard and the corpse of the gun captain was thrown ontothe bridge where it landed next to Capt. Sherman. Water mains in the forward part of the ship proved useless, since theyhad been broken by the force of the explosions. There was no water availableto fight the conflagration forward, and the fires continued to set off ammunition,bombs, and gasoline. As the ship listed to starboard between 10 and 15 degrees,oil and gasoline, released from the tanks by the torpedo hit, caught fireon the water. Sherman slowed to 10 knots, ordering the rudder put to port to try toget the wind on the starboard bow he then went astern with right rudderuntil the wind was on the starboard quarter, in an attempt to keep the fireforward. At that point, some flames made central station untenable, andcommunication circuits went dead. Soon, a serious gasoline fire broke outin the forward portion of the hanger, within 24 minutes of the initial attack,three additional major gasoline vapor explosions occurred. Ten minutes later,Capt. Sherman consulted with his executive officer, Comdr. Fred C. Dickey.The two men saw no course but to abandon, as all fire-fighting was provingineffectual. The survivors would have to be gotten off quickly if unnecessaryloss of life was not to be incurred. Reluctantly, after consulting with Rear Admiral Noyes, Capt. Sherman ordered "abandon ship" at 1520. All badly injured men were lowered into rafts or rubber boats. Many unwounded men had to abandon from aft because the forward fires were burning with such intensity. The departure, as Capt.Sherman observed it, looked "orderly," and there was no panic.The only delays occurred when many men showed reluctance to leave until all the wounded had been taken off. The abandonment took nearly 40 minutes;and, at 1600- satisfied that no one was left on deck, in the galleries orin the hangar aft-Capt. Sherman swung over the lifeline on the fantail and slid into the sea.